The PghTee is a T-shirt show and sale. This is one of the many events for Pittsburgh Craft Beer Week, so yes there will be beer. Cost: Free, unless you want to buy t-shirts, and you will want to buy a t-shirt. Which came first the T-shirt of the Blog? The universe keeps bringing me back to Pittsburgh t-shirts. 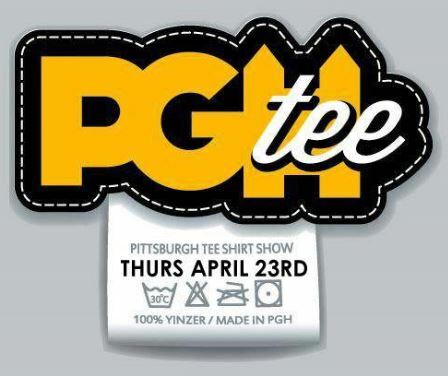 Here is a brief history of how t-shirts are responsible for the creation of this blog and how the PGHTee t-shirt show came to be (which all goes back to a comment from a reader of this blog). Back in 2003, in the days before blogs were even a thing, I was bored on a rainy Sunday afternoon and made a visit to the Andy Warhol museum. Before I left the museum, I stopped in the basement to try screenprinting. I left the museum, drove to the art supply store and decided I would teach myself to screen print. 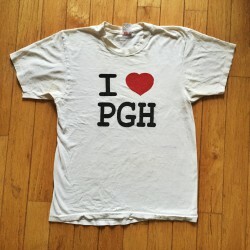 The first t-shirt I printed was the “I heart PGH” t-shirt. I printed t-shirts in the basement of my mom’s house. I would make my sisters hold the screens while I printed the shirts. They still refer to the basement as my sweatshop. I am pretty sure the t-shirt in the photo is one of the first that I ever printed, I can tell because it was printed on a Hanes under-shirt that was most likely purchased at Gabes. I went on to start a little t-shirt company and found a Duquesne student to build my first website. And in true Pittsburgh fashion, last year I worked on a big project and that same Duquesne student is now a big developer at a big Pittsburgh business. My little business grew and I got a few orders and I needed a partner to print some shirts (my sweatshop crew couldn’t keep up with the demand). One day I was leaving the Avalon Exchange, back when it was located in Oakland in the space that is now occupied by NoWait. I picked up a flier for a screenprinting place located on the South Side. Keep in mind, this was back in the day before Twitter, before Facebook, we are talking back in the era of Friendster and MySpace. And people, certainly not me, did not use the internet to reach out to connect to strangers. I emailed the screenprinter and we met for a cup of coffee. I am pretty sure we met at one of the Beehive coffee shops, this was back when there was a Beehive location in Oakland (which is now the noodle shop/T-mobile). That is how I met Dan Rugh, back when he was running his screen-printing shop was in the basement of his house. Today, Commonwealth Press has a storefront on Carson Street, a warehouse/production facility on Wharton Street, a t-shirt truck and employees at least a dozen people who are passionate about printing stuff. In 2004, I quit my job and went to work on the Kerry/Edwards campaign. After that I worked on was Bill Peduto’s first campaign for mayor of Pittsburgh. The campaign didn’t have any money, so we made campaign t-shirts by collecting old t-shirts, and then we headed over to AIR on the open studio nights. AIR is short for Aritst Image Resources, a non-profit organization located on the North Side that basically exists to help people print things. I wish I had known about AIR when I was first learning to screen print. 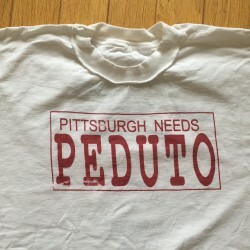 We turned the old t-shirts inside out and printed the Peduto logos, designed by local artists, on the inside-out-t-shirts. While working on this campaign, I met Dave Mansueto, who was just getting into podcasting and would spend hours trying to explain RSS feeds to me. I knew how to build an HTML website and at the time, I was convinced that is all I would ever need to know. In the fall of 2005, I was unemployed and using my big old desktop computer to build some websits. This blog started as a kind of a joke between Natalia Rudiak. Natalia was another person who I had met while working on the first Peduto campaign. We would talk about what politicians were saying about why young people wanted to move to Pittsburgh and how they were often wrong. So in response, I built a website. I decided to give WordPress a try, seemed like a faster way to build a website than HTML, and IheartPGH was born. A huge THANK YOU to Dave Mansueto for patiently schooling me on the virtues of the RSS feed. If you are interested in podcasting, Dave is the person to talk to and you should check out his app, bossjock studio @bossjockapp , which is one of the best apps for recording a podcast from an iphone/ipad. Never in a million years did I think that blogging would become my job. But thanks to one of our readers who left a comment on the blog, I learned that the t-shirt company Spreadshirt was hiring a blogger. I applied and my official title was Wizard of Web 2.0. A few years later, I had been laid off from Spreadshirt. It should come as no surprise that when you have to have a round of layoffs the the first people to go are the bloggers or the people who had the word wizard in their job title, so I was doubly doomed. In what was probably yet another round of underemployment for me, I happened to be scheming, I mean meeting, with Dan Rugh and a host of other local bloggers who love Pittsburgh and t-shirts. We decided that Pittsburgh needed a t-shirt day event too. Thus the Pittsburgh T-Shirt show was born (you can see a list of some of the vendors from the first PGHTee event here. 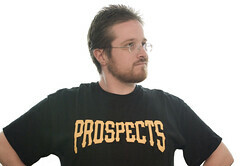 Thanks to the first Pittsburgh t-shirt show, we met even more Pittsburgh t-shirt lovers like Dave White aka @MrDestructicity who was running his own t-shirt project wearing and documenting all of the t-shirts that he owns. Thanks to the crafty thinking of Dan Rugh, the Pittsburgh T-shirt show is in its 5th year and now one of the many great events for Pittsburgh Craft Beer Week. As I write this blog post, I am kind of amazed that I reached out to Dan in the first place. I was incredibly shy and I wouldn’t go anywhere by myself. I am thankful that Dan continues to be a sounding board and cheerleader for my ideas. Today, thanks to Andy Warhol, some t-shirts, a blog, I will pretty much go anywhere and talk with anyone. I hope to see you tomorrow (or today, depending on when you are reading this) at the 5th Annual Pittsburgh T-shirt show. 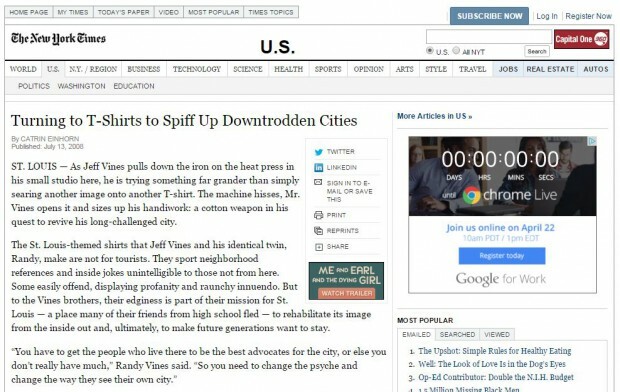 I will gladly be toasting the t-shirt, especially the Pittsburgh t-shirt.